This is a massive, ambitious opera from the late 19th century by Arrigo Boito, composer, critic and later librettist for the late works of Giuseppe Verdi. Boito attempted to create an Italian stage drama importing some of the ideals and principals first espoused by Richard Wagner to retell the Faust legend on an epic scale never before attempted. 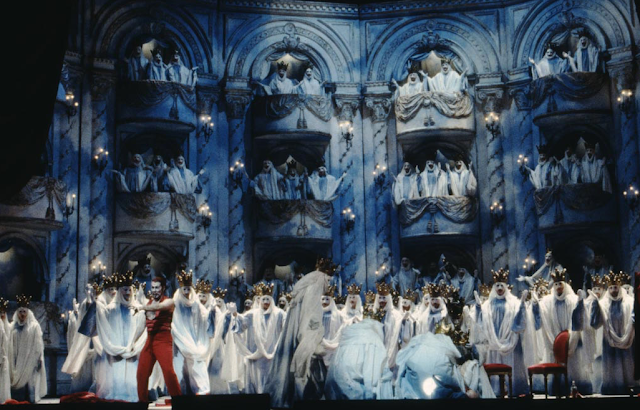 Mefistofele comes to Heaven and makes a bet with the Almighty that he can win the soul of Faust, a noble but elderly scholar who is near the end of his life. The Devil then strikes his infernal bargain with Faust, granting him youth. The action then moves through various parts of the Faust story including his romancing of the gullible maiden Margherita, his Classical romance with Helen of Troy, his ultimate redemption and Mefistofele's inevitable defeat. Tell me something else interesting? Mefistofele was a complete fiasco when it had its initial performances in 1868. Boito worked to heavily revise the work, cutting down its length and bringing it back to the stage as a success in 1875. However, it remains his only completed opera. The composer never completed the last act of his second opera Nerone, before his death in 1918 That work was completed by a team of three composers led by conductor Arturo Toscanini, and premiered at La Scala in 924. It is rarely revived. If Mefistofele has a flaw (and all machinations of the devil certainly do!) it's that the first 25 minutes of the opera outshine the rest of the work. Boito's setting of the epic wager between good and evil for large orchestra, offstage trumpets and an army of choristers all singing the praises of the good Lord above behind the scenes. It is so grandiose and over-the-top that it leaves the audience a little bit shell-shocked for when the drama actually starts. Later, here are spectacular arias for Margherita ("L'altra notte in fondo al mare") and Old Scratch himself ("Ecco il Mondo, Vuoto e tondo") but it's that opening that makes the greatest impression. These performances star Christian Van Horn in the title role and tenor Michael Fabiano as the gullible Faust. Margherita is sung by bel canto specialist Angela Meade, who is moving into heavier repertory at this point in her career, as sopranos do. Mezzo Jennifer Check, one of the veterans of the Met stage and one of its hidden gems, is Helen of Troy. Robert Carsen's traditional staging uses elements of Italian commedia dell'arte and old-fashioned scenic ideas to present Boito's cosmic vision. Faust looks like a young tenor, Mefistofele has horns and dapper red pajamas, etc. The Met has not offered this production, which originated at the San Francisco Opera, since 2000. The show opens Nov. 8 for a short run of just four performances. For that information, visit and join Superconductor's Patreon page, and help support the cost of independent music journalism in New York City at the low cost of just $5/month.